There is a Yin and Yang with disruptive technology. When gunpowder was invented, it was used for celebrating life (fireworks) and at the same time for taking lives (guns). In our lifetime, we have seen many inventions punctuate the future and this blog post is about one of them: 3D Printing. As these 3D printing devices become more precise, easier to use, and cheaper to acquire, everyday life will change forever. But more importantly, this new capability will be used for both good and evil. This to me is the way you know the technology will be durable and long lasting: it does not pick sides, it is just freekin awesome. In the same week, a new Department of Homeland Security intelligence bulletin warns it could be “impossible” to stop 3D-printed guns from being made, not to mention getting past security checkpoints and another CNN Health article tells us how 3D printing help save a dying baby. 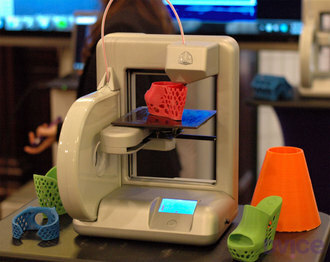 The quote goes “We can put together a complete copy of a body part on the 3-D printer within a day,” Green said. “So we can make something very specific for a patient very quickly.” How’s that for contrast?! And with it a new domain of craftwork is born. One that stands on the shoulders of the old but ties to our physical world we live in like nothing before it. Imagine products for your growing child being just printed at home. You could have their accessories always be the right size through their growing years. Imagine never having to do the dishes because everything you use to eat could be printed just in time for the meal and then after the meal, recycled to be printing supply again. But ultimately, I see 3d printing as a way to give rise to robotics that become self-maintaining and evolve more like their biological counterparts; a day when a computer can build and evolve itself. Parts can wear out or get outdated and new part printed and integrated. We are not very far off from simple systems that can be ‘born’ with the minimal set to survive. And again with the contrast, these highly evolved robotic systems will help us with our aging population and by the same token, be used for war and terror. Silly silly humans. This entry was posted in 3D Printing, Robotics and tagged 3d printing, department of homeland security, robotics. Bookmark the permalink.